What is a Trust Profile? How is trust built in the Nomador community? The Trust Profile is the form used by members to introduce themselves when making contact with one another. When you are contacted by another member, you may click on their Trust Profile. 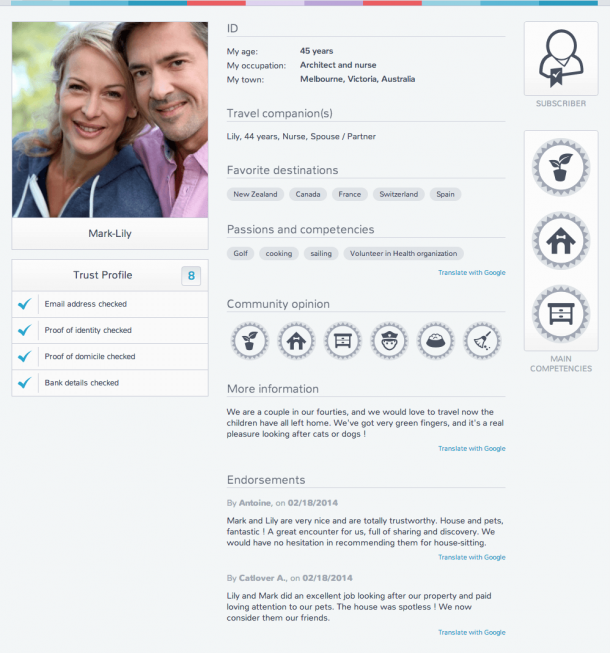 The Trust Profile indicates that member’s status, which you may wish to ascertain before you enter into discussion. All members’ Trust Profiles are accessible at all times to other members. A member’s Trust Index depends on how many checks have been undergone by the member from 0 (no check) to 8 (all requested ID documents checked by moderators). Endorsement badges are issued after a successful house-sit to identify house-sitters’ or home-owners’ special skills and aptitudes. Recommendations are issued in the form of written comments which members can at their discretion display on their Trust Profile. Prospective home-sitters and homeowners get into contact freely and swap information, dates, etc. on a secure email system. Discussion takes place without divulging sensitive personal information. Home-owners and home-sitters can protect their identity by chatting under first name or by alias. Your personal email and identity is protected at all times. Requests for registration are regularly screened by website moderators. Each proof of ID submitted is individually cleared for approval. New adverts are systematically reviewed by moderators who act if a message or information displayed does not meet house rules. The vigilance of its members gives added resilience to the Nomador community. The “Notify abuse” function sends an immediate alert to Moderators if suspect behavior or information is observed. When a member who has not submitted any document to validation establishes contact with another one, the following mention appears : This profile has not been verified by Nomador". A full Trust Profile looks like THIS! 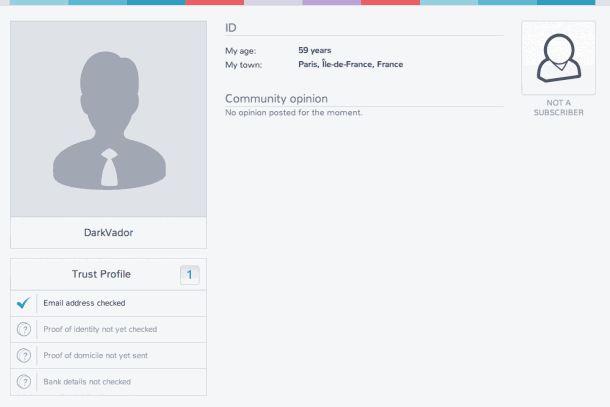 Which Profile would you trust?